This page features older news items from 2004 which have previously been featured on the main news page. Out now is the Platinum Collection, a 3 CD Genesis retrospective. Of special note is the fact that many of the older tracks in the Collection have been newly mixed by Nick Davis, including The Knife from Trespass. The album I Hear Talk by British pop group Bucks Fizz which was first released in November 1984, has recently been re-issued for the first time on CD. The album includes their version of Tears On The Ballroom Floor, a song that Ant co-wrote with Roy Hill of the band Cry No More. The CD re-issue boasts 8 extra tracks as well as new sleeve notes. 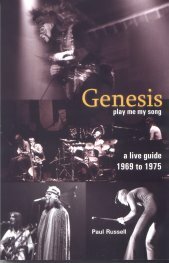 Out now is Play Me My Song, a new book written by Paul Russell that focuses on the live shows Genesis performed between 1969 and 1975 with the emphasis on live recordings (official and otherwise) currently in circulation amongst collectors. The book features reviews of over 160 shows from the Peter Gabriel era. The book also includes a complete transcript of the joint interview that Ant did in 2001 with Mike Rutherford and Tony Banks about the band's live shows. Update: In case anyone is wondering, the photo of Ant with Peter Gabriel included in the book was taken in 1977 and not 1974 as the caption suggests. Ant has recently spent some time in between Library projects recording many of the new pieces he has written for the next Private Parts & Pieces album. He has now written and recorded over 40 tracks for it together with a number of links and is basing the material around stringed instruments of all varieties including 6 & 12-string guitars, classical guitar, charanga and cittern in a mixture of solos and duets. Work will continue on the album in between future Library projects. Ant has recently done an interview with Robin Johnson for the UK-based Music Mart magazine, and this forms the basis of a three page feature in the September edition which is out now. In Robin's own words: "The feature concentrates on his library music and solo album careers. Genesis has already been covered ad-infinitum!" The same issue also includes a review of Archive Collection Volume 2. Thanks to Robin for passing on the details of the interview. The BBC2 documentary programme The Mysteries of the Medieval Ship which made use of a couple of Ant's album tracks amongst other pieces is scheduled for repeat broadcast on Saturday 10th July at 8:10 pm. The programme, which was first broadcast in January, examines the history of a medieval merchant ship, the well-preserved remains of which came to light in 2002 on the banks of the River Usk in Newport, Gwent. Ant's record company Voiceprint have recently launched their own web radio section, which features a number of interviews with a variety of their artists. Ant has recorded an interview for this with Jon Kirkman and this is now available to listen to on-line in streaming form. You will need Real Player to hear the interview. Click here for the web radio section on the Voiceprint site and navigate to Ant's interview using the radio dial (it's the first one on the left hand side). In addition, Ant also recently answered some questions submitted by fans and you can read the results here. A new Italian Genesis book entitled "Genesis: il fiume del costante cambiamento" is out now. Written by Mario Giammetti (the editor of the long-running Italian Genesis magazine Dusk), the book includes over a 100 photos of the band including some rarely seen shots. In addition, Ant has written the preface to the book. You can read our review of the book here. Some sad news: wildlife film-maker Nick Gordon died last month whilst in Venezuela to start work on filming a new programme in a planned series of seven shows called "Secrets of the Amazon". Ant has written a special tribute to Nick which you can read here. In collaboration with Joji Hirota, Ant had written and recorded the music for a number of Nick's programmes in the last few years including Creatures of the Magic Water, Jaguar: Eater of Souls and Gremlins: Faces In The Forest. Archive Collection Volume 2 is out now. The release date for Archive Collection Volume 2 has been rescheduled and is currently set for May 10th. If we receive any further updates on this then we will post them here. Ant has agreed to sign all copies of Archive Collection Volume 2 that were pre-ordered before the original planned release date of 26th April from Camino Records. The slight delay in the release date will mean that pre-ordered copies will not now ship this week. Click here for the relevant page for Archive Collection Volume 2 on the Camino site to order your copy. Originally announced for release in January this year, the Virgin/EMI re-pressing of 1984 has had announced release dates come and go several times now. The latest information has no definite release date for the CD. Should a revised release date be announced for the CD then we will of course announce it here. The planned re-release date for 1984 has moved yet again and the latest information now has the release date set for 5th April. As previously mentioned, this is a straight re-pressing of the 1991 CD re-issue and there are no extra tracks included on the CD. The full track listing for Archive Collection Volume 2 has been announced and can be found on a special page here. The 2 CD set is currently scheduled for release on 26th April and it includes two hours worth of previously unreleased material recorded between 1971 and 1988. Ant is currently working on a new Library Music project for Atmosphere. As with all of Ant's Library music this won't be commercially available. A forthcoming programme in the BBC2 documentary series Timewatch called The Mysteries of the Medieval Ship is set to make use of a couple of Ant's album tracks amongst other pieces. The programme examines the history of a medieval merchant ship, the well-preserved remains of which came to light in 2002 on the banks of the River Usk in Newport, Gwent. The work to compile Archive Collection Volume 2 is nearly complete, with artwork, track information and some track titles currently being worked on and final mastering due to take place in early February. As previously mentioned, Archive Collection Volume 2 is a 2 CD set and we can now confirm that it will contain 36 previously unreleased recordings (a mixture of previously unheard pieces alongside alternate versions and different mixes of known tracks) made between 1971 and 1988, with a total playing time of over 2 hours. A full track listing and further information will be announced in due course. EMI are making the Virgin CD of 1984 available again after it became unavailable last year. The latest information suggests a release date of 9th February and the CD can be ordered from Amazon. This is a straight re-pressing of the 1991 CD re-issue and there are no extra tracks included on the CD. Chris Stewart was featured in the final programme of a three-part series on BBC Radio 4 entitled A House Somewhere, which was broadcast on 10th January. The synopsis for the show reads: When sheep farmer Chris Stewart wrote Driving Over Lemon, his expectations were understandably low, given that his three previous ventures - playing drums for Genesis, running a Sussex sheep farm and writing guide books to China - had left him destitute, scratching a living in a cheap farm on a poor, rocky Spanish hillside. But the book has been a world wide hit. Villagers in nearby Orgiva are even thinking of erecting a statue to him. But his wife Ana is tired of coping with the farm on her own while Chris is off on extended book tours. Is Chris still the optimist he started out as? Anthony Sattin goes looking for him in the sheep pen. Thanks to Phil Morris for passing on the details about this. The somewhat confusing saga of the availability of the Virgin CD release of Wise After The Event continues. A limited number of copies of the CD were available from Amazon but not surprisingly were quickly sold and as we post this revised news they are currently out of stock. In the meantime, Camino Records have copies of the CD available and you can access the relevant page for Wise After The Event on their site by clicking here. A reminder again that the pressing of the CD currently available is a re-pressing of the original 1991 Virgin CD re-issue - there are no extra tracks added to the album other than Squirrel, which was the B-side of the single release of We're All As We Lie. The planned Voiceprint re-issue of the album will still take place after the release rights revert to Ant's control.